Professional chimney pipe installation is an absolute necessity for steering smoke out of your house. Along with chimney flue caps and roof flashing maintenance, chimney pipes direct smoke from your fireplace out and away from your home. The wrong pipe can trap smoke instead, leading to creosote buildup in your chimney and smoke stains on your walls. Wisconsin Chimney Technicians provide expert chimney pipe installation to keep your fireplace clear of smoke. If you have a woodstove for keeping the house warm during cold winter months, setting up a chimney pipe properly can improve heat efficiency. 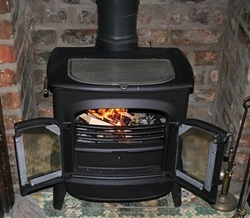 A woodstove which doesn’t remove smoke in a timely matter will be unable to burn at a higher capacity. The right pipe will fix this issue and result in a cheaper, more preferable heating option for your home. With a freestanding stove, installing a chimney pipe yourself is possible yet not recommended. Any misalignment between the stove and pie can release smoke into your home. Schedule an affordable, professional installation from the experts of Wisconsin Chimney Technicians. Our experienced chimney masons have worked on hundreds upon hundreds of chimneys in virtually every location across Milwaukee, from Waukesha and Brookfield to Mequon and West Bend. 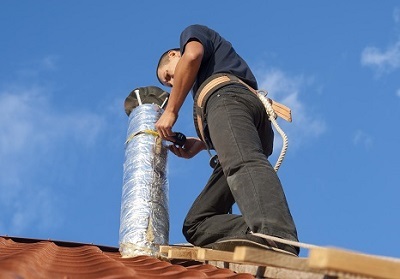 At this point, there are few situations Wisconsin Chimney Technicians have not encountered, whether the job is installing a chimney pipe, sealing a roof flashing, or repairing a chimney flue cap. With a 100% success rate, our chimney pipe installation service means no worries about future leak repairs. Our installers expertly keep the roof flashing sealed to avoid all of the common issues. We recommend annual inspections to provide necessary maintenance. In addition to chimney pipe installation, Wisconsin Chimney Technicians masonry experts rebuild and restore brick chimneys. Upgrade your home with a new chimney system if your woodstove is no longer enough to heat your home. Contact our unbeatable chimney pipe installation professionals today.